Inspired by Clower’s conjecture that the necessity of trading through money in monetised economies might hinder convergence to competitive equilibrium, and hence, for example, cause unemployment, we experimentally investigate behaviour in markets where trading has to be done through money. In order to evaluate the properties of these markets, we compare their behaviour to behaviour in markets without money, where money cannot intervene. As the trading mechanism might be a compounding factor, we investigate two kinds of market mechanism: the double auction, where bids, asks and trades take place in continuous time throughout a trading period; and the clearing house, where bids and asks are placed once in a trading period, and which are then cleared by an aggregating device. We thus have four treatments, the pairwise combinations of non-monetised/monetised trading with double auction/clearing house. 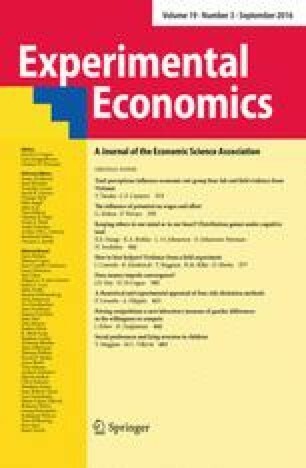 We find that: convergence is faster under non-monetised trading, implying that the necessity of using money to facilitate trade hinders convergence; that monetised trading is noisier than non-monetised trading; and that the volume of trade and realised surpluses are higher with the double auction than the clearing house. As far as efficiency is concerned, monetised trading lowers both informational and allocational efficiency, and while the double auction outperforms the clearing house in terms of allocational efficiency, the clearing house is marginally better than the double auction in terms of informational efficiency when trade is through money. Crucially we confirm the conjecture that inspired these experiments: that the necessity to use money in trading hinders convergence to competitive equilibrium, lowers realised trades and surpluses, and hence may cause unemployment. The online version of this article (doi: 10.1007/s10683-015-9456-x) contains supplementary material, which is available to authorized users. The authors would like to express their gratitude to Andrea Lombardo for writing the software in Visual Studio for these experiments. We also thank LUISS for use of their purpose-built laboratory, run under the auspices of CESARE. Finally we would like to thank the Editor and three referees for invaluable comments which led to significant changes in the paper.